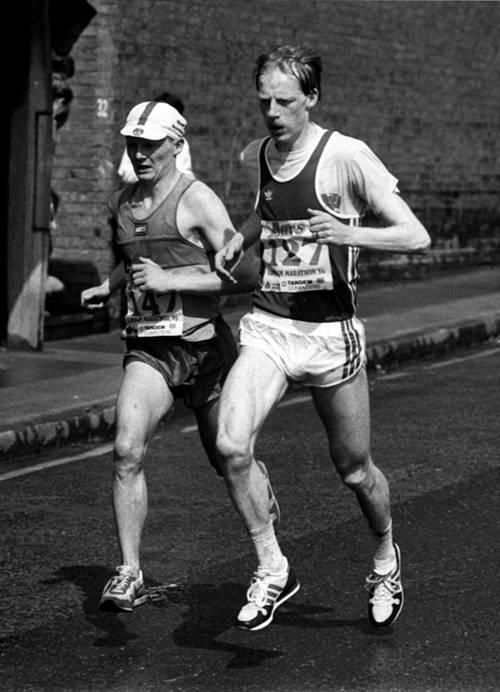 Charlie Haskett (127) running in the London Marathon 1985 with Terry Mitchell. Dundee Hawkhill Harriers is one of the oldest clubs in Scotland and also has a women’s section dating back to the beginnings of Scottish women’s cross-country running in the early 1930’s. They produced women cross-country and track champions such as Mildred Storrar and of course currently they have Olympian Eilish McColgan following in her mother’s very successful footsteps. But the men have been no less successful and while Mildred Storrar was winning titles, the men were doing well with men such as Alex Donnett and Charlie Smith winning international caps for the men. Dundee was a real hotbed of athletics and Charlie’s brother Suttie Smith – one of the real stars of the sport – competed for Dundee YMCA although the main rivals to Hawkhill was the now-defunct Dundee Thistle Harriers. Colin Youngson has selected several runners from a particular spell of real success for the grand club and his account is below. Dundee Hawkhill Harriers were formed in 1889. They were the best club in their area for many years and promoted classic road races such as the Kingsway Relays and the Perth to Dundee. Back in the 1960’s they fought with Aberdeen AAC for supremacy in the North-East Cross-Country League, producing runners like Fergus Murray, Ron Coleman, Phil Kearns, Rab Heron, Doug Gunstone and Ian Graves. However in Scottish National Competitions, their best teams featured in the late 1980’s and early 90’s. Liz McColgan was world-famous but male club-mates included her husband Peter McColgan, Charlie Haskett and Iain Campbell, as well as ex-Clyde Valley star Peter Fox Chris Hall (Welsh international, previously Aberdeen AAC), Dave Beattie, Richie Barrie, hill runner Des McGonigle, Matt Strachan, Paul Briscoe and Craig Ross. Ross Copestake won the Scottish Cross-Country Under-17 title in 1980 and went on to run for his country in the World Cross as a junior and as a senior. Terry Reid also won the Scottish Under-17 title in 1987. In the Edinburgh to Glasgow Relay, DHH were a top ten club for several years before breaking through in 1989 when they achieved a tremendous victory. Dave Beattie was second on the first stage, Peter McColgan brought them into the lead with the fastest time on Stage Two, and Terry Reid, Craig Ross, Iain Campbell (fastest on Five), Charlie Haskett, Richie Barrie and Peter Fox retained first place to the end, a minute and a half clear of Cambuslang Harriers. The following year, by only four seconds, the Hawks lost a titanic battle with Falkirk Victoria Harriers. B Pattieson was fastest on Stage Seven and the other silver medal winners were P McCanna, B Cook, Chris Hall, Charlie Haskett, Richie Barrie and both Iain and Ian Campbell! Charlie Haskett was a real stalwart for Dundee Hawkhill Harriers (Charlie’s father Chick was a good runner, his elder sister Christine was a major Scottish star on track and country and his son Mark is also a fine athlete.) Charlie won the East District Senior Boys CC in both 1972 and 1973, followed by East District Youths CC in 1974 and 1975. Then in the 1975 National CC, he won a silver medal in the Under-17 age-group behind the peerless Nat Muir. In 1976 he finished eighth junior. Charlie represented Scotland in the IAAF World Junior CC in both years. His consistency in the Scottish Senior National was outstanding: six successive top ten performances between 1984 and 1990. His best placing was sixth in 1985. Charlie won four Scottish CC medals with DHH: bronze in 1990 and 1993, and silver in 1991. In the Scottish CC Relay he won team silver in 1990. The Six-Stage Road Relay produced considerable success for the Hawks and Charlie Haskett won team silver in 1989 and 1991, and must have enjoyed the victories in 1990 and 1994. He ran 18 E-G’s, including team gold in 1989 and silver in 1990. In the summer season Charlie ran well in the steeplechase and 10000m (30:24) and gained Scottish international vests as a marathoner, with a best time of 2:18:41 (1984) and silver medals in the Scottish Championships (1984 and 1987). This durable athlete went on to run well as a veteran on country and road. Peter McColgan was a Northern Ireland international who ran in the 1986 Edinburgh Commonwealth Games, reaching the Final in the steeplechase and 5000m.. By 1987 he was running for Dundee Hawkhill Harriers and won the 1988 East District CC title. Twice Northern Ireland steeplechase champion, in 1990 he won the Scottish 5000m title. Then in 1991 he he claimed UK steeplechase gold. He represented Great Britain in the 1991 World Athletic Championships steeplechase in Japan. His track personal bests include two NI records (3000m indoors 7:54.48, and steeplechase in 8:27.93.) and a mile in 3:59.37. Peter contributed a great deal to DHH success from 1987 to 1994. He was fastest on Stage Two of the E-G in 1987 when his club finished fourth. Then he was fastest once again on Stage Two in 1989 setting Hawks on the road to victory. In 1989 he was part of the team which won silver in the Scottish Cross-Country Relay and then gold in the same event in 1990. In the Six-Stage Road Relay, he gained team silver in 1989 and 1991 and then gold in 1994. However his finest moment must have been when he won the Scottish Senior National Cross-Country title in 1990, leading DHH to bronze. Peter also finished second individual in the 1991 National, with the Hawks being second team as well. Iain Campbell (born 1960) originally ran for East Kilbride AAC, running the World Junior Cross-Country in both 1978 (27th) and 1979 (an outstanding 10th). Then he went on to Clemson University in the USA, recording a 5000m best of 14:02.0 in 1985. He represented Dundee Hawkhill Harriers from 1989 to 1994. Apart from making a major contribution to gold and silver medals in the 1989 and 1990 E-G, he featured in three further championship wins: 1990 and 1994 Six Stage and 1990 Cross-Country Relay. Always enthusiastic and hard training, Iain went on to become a regular and successful member of the Scottish Masters squad for the annual Five Nations CC International. Near namesake Ian Campbell was ten years younger and a track specialist (800m and 1500m) with impressive junior bests of 1:53.6 and 3:51.5. His senior club 1500m club record is 3:43.64. He was sixth on Stage One of the E-G in both 1990 (team silver) and 1992. In addition he helped the Hawks secure team gold in the 1994 Six-Stage Road Relay. Peter Fox (born 1962) originally came from Motherwell district and showed a great deal of athletic promise. In 1978 he won bronze in the National Cross-Country Under 17 championship, and then gold in the Scottish Schoolboys Track 3000m. In 1979 he finished first in the National Cross-Country Under-17, and won the Scottish Schoolboys 5000m. In 1980 it was silver (behind Graham Williamson but in front of George Braidwood) in the Under-20 National Cross-Country. 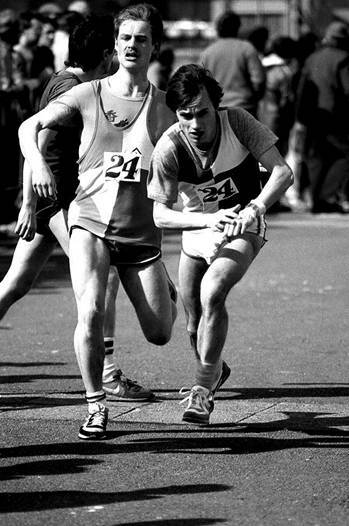 Peter Fox ran for Scotland in the World Junior Cross-Country in both 1979 and 1980. By now, along with Brian McSloy and Colin Farquharson, Peter was one of the young lions racing for Clyde Valley AC. In 1979 (along with future 800m star Tom McKean) he was one of the team that won the Scottish Cross-Country Relay Young Athletes Championship. Then Peter won two senior team gold medals in the 1979 and 1980 Edinburgh to Glasgow Road Relays, as well as two silver medals in the 1979 and 1980 Six-Stagers; and two more silver in the E-G when Peter was fastest on Stage Eight. The 1982 Senior National Cross-Country produced team silver. In the 1983 E-G, Clyde Valley AAC finished third with Fox fastest on Stage Four. Then in 1986, running for Motherwell YMCA Harriers, Peter won the West District Cross-Country Individual title. He was fourth in the 1988 Senior National Cross-Country. Peter Fox studied for a medical degree at Dundee University and subsequently worked in the area as a doctor. So Dundee Hawkhill Harriers must have been very pleased when he eventually joined them first-claim, making an immediate impact with a superb third place in the 1989 Senior National over a tough, hilly, snow-covered course at Hawick, behind Tommy Murray and Anglo Paul Evans but in front of Steve Ovett! With the Hawks, Peter went on to win gold in the 1989 E-G and 1990 Six-Stager; plus silver in the 1989 Six-Stager, 1989 Scottish Cross-Country Relay and 1991 National Cross-Country, and bronze in the 1990 (tenth finisher) and 1991 National. Although his training after this may have been reduced due to work commitments, this cheerful, popular runner can look back a career with so many fine achievements. * In the Six-Stage Road Relay, Dundee’s medallists (gold in 1990 and 1994 and silver in 1989 and 1991) included Haskett, McColgan, both Campbells, Peter Fox, B Cook, P McCormack, P McCavana, D Storey, Matt Strachan, J Hill, Craig Ross, Des McGonigle and Chris Hall. That is where Colin’s account of the DHH Fast Pack concludes but of those mentioned above, I knew Hugh McKay and Richie Barrie through their involvement in British Milers Club races that I organised in the mid-80’s. Hugh (DoB 18/06/60) was a man of several clubs, having run for Central Region and Dundee University before joining the Hawks and he currently runs for Fife AC. He was a good, honest runner who always gave of his best and by 1985 his best 1500, time was an excellent 3:48.3. Richie was younger, Date of Birth 10th March 1963, but was also a good runner. After the BMC Annual General Meeting in Glasgow in 1985, he offered to organise it for the following year in Dundee but was unfortunate that the National Committee wanted it back in England again. In 1985 his pb for 1500m was 3:49.47 at the age of twenty one.